A DEFINITE Backsaver at This Size! The lightweight aluminum construction of this wrench makes it much easier to use than its cast iron counterpart. This is especially true if you have to use the wrench reaching away from you, rather than right over the fittings. If you need to heat your fittings before disassembly operations, use the torch before applying the wrench. I watched a guy carelessly melt the handle of his wrench while "torching" a pipe. He had the jaws of that wrench red hot! That's not covered on the warranty. I've never needed more leverage than this long wrench provides, but if you do, they make one bigger. The differenc in price between this wrench and the iron one is less than one day off with a bad back. You won't be disappointed with Rigid! I like the light weight of this pipe wrench. The tool is plenty strong. Everyone know that Rigid makes excellent equipment. These 18" pipe wrenches are no exception. They are lightweight and durable. I was a field engineer working on industrial furnaces for a while and trying to carry all of the tools you need everywhere you go can be quite cumbersome to say the least. I have never had any problems with them (I own 2 of them) and have done just about everything with them. If you have to use them a lot it won't take long to notice how much easier it is to do a job when your tools aren't weighing you down. 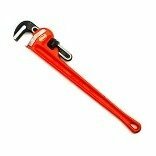 If you need 18" pipe wrenches give these some serious consideration. Rigid has made the best pipe wrenches for decades. The Aluminum models are every bit as tough as their cast iron counterparts, only lighter. You do have to be more careful with aluminum if you are working around a torch, it can get heat damaged more easily. I have used this 18" wrench for over 15 years, building and disassembling chemical loading systems of galvanized pipe. Mine has a little less paint on it, but the jaws are still sharp. The jaws are replacable, but I've never had to do that. 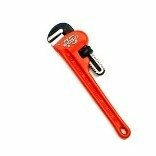 I have also used this wrench for home plumbing projects, but it is a little large when working in a sink cabinet. I use it mainly as a "holder" in that duty, turning the fittings with a 10" wrench. I've used one of these for 15 years and never worn it out. I used mine to assemble and disassemble (much harder) 1-1/2" and 2" pipe on chemical loading systems. I've used a "cheater" on this wrench (not recommended, use a longer wrench) and did not bend it. I have seen one that was bent and the only way that could have happened was if a 3-4' cheater was used on it. The difference in weight from the cast iron model is significant. The difference in price amounts to about one visit to the chiropractor - buying the aluminum one is a no brainer if you look at it that way! This gets more apparent as the size of the wrench increases. It does what it says on the box. And quite frankly, I am astonished that Henry Raddick didn't make any reference to the fact that the brand-name is "Ridgid." If ever a name were tailor-made for mockery, that would be it. If you have it all. The Ridgid Air Powered Caulk Gun is a must have especially if you want to impress your home improvement friends. I can honestly say I can't think of a negative thing to say about the product. On the positive side not only is there zero hand fatigue you can extrude long runs of caulk around door, windows, etc. in a controlled manner. It makes very smooth tool free joints and performs flawlessly. Whoever it was who first said "Manners maketh man" obviously forgot all about power tools. This is a fine product as well you would expect for a tool that Dave Hodo (pictured - original Construction worker with Village People) puts his endorsement to. "Adhesives, silicones, or sealants - this baby'll power-push it like a dream" enthuses Hodo, and I have to agree with him. This is a superb tool. I wanted to caulk the openings between the foundation of our house and the frame of the house to keep scorpions and other pests out. They like to get into these openings and eventually into your house. This meant doing several hundred feet of caulking and I was not looking forward to doing that with my manual caulk gun. I saw this on Amazon and decided to give it a try. It works great! It's easy to use and, with a little practice, you can run a nice controlled flow of caulk. It's very easy to set up the variable flow rate so that it dispenses the amount of caulk that you need. I look forward to using it on smaller caulking jobs around the house. At first I was hesitant to buy a pneumatic caulk gun; didn't think my residential use of it would justify it. But the price being so right, I tried it. Wow, how'd I get along without it? If you have a compressor or air tank, this tool lets you concentrate on perfecting the bead. I went through 5 tubes of caulk the first couple of hours I used it. It was designed quite well, heavy plastic body makes cleanup a breeze. If I HAD to find something wrong, I'd say I'm a little surprised they didn't include a fold-out puncture pin. But with the time this baby saves me, I'm glad to carry a piece of wire!! Works Great !, Definately worth the money! I bought this item for the Rigid shop vac with detachable blower(basically the same unit as the Sears Craftsman version). It makes a noticable difference in reducing the FREQUENCY of the sound, thus eliminating the higher pitched whine that you get without the unit. Although I can't say for sure that it makes the overall sound quieter( I don't have a dB meter), it certainly makes it seem quieter and MUCH more bearable. You do have to watch where you point it though because it will shoot a blast of air in that direction (although this is by design, it is the blower port after all. Also it not fully inserted, it my be shot out by the rush of air when you first turn it on. Worth the money! I got this for the sears 6 hp shop vac with detachable blower. This muffler substanstially reduced the noise especially the high piched squell. just watch where you point it because the air blows very strongly out of it. Most of the noise coming from the vaccuum comes straight out the top. If you're inside, the muffler (which attaches to the exhaust) does nothing because the exhaust noise is nothing compared to the motor noise. Outside, the motor noise goes straight up and away and the exhaust noise is more of a factor. I've seen these (and similar tools) advertised for a while now and finaly decided to buy one. They're great! Ever wonder why what seems like the simplist designs only come out...well, when someone with really good observation skills invents it! This is the tool. Get this one, the bigger size, and throw away all your other pliers. Better yet, give them to your spouse/kid and hope they don't find these! If only all hand-tools worked as well as RoboGrip pliers. I can't imagine using regular slip joint pliers ever again for anything. They are big enough and strong enough for any job... and they self-adjust! You won't be disappointed if you buy a pair of these. to tell the truth,the robogrips made by craftman are just plain better. for the price of one made by rigid, you can buy two of the craftman(9&7inch combo) the craftman also come in a v-notch model, and they feel much nicer to use too. 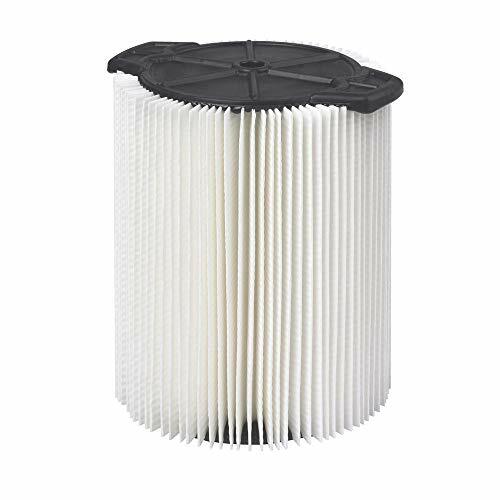 I own several products by rigid that I simply love to core,but I wasted my money on this one. Is this the best value?